Quantum's new clear see-thru security bin cabinet allow you to check cabinet's contents while maintaining security. 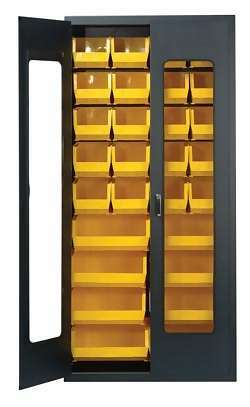 Cabinet comes fully assembled, ready to use and is constructed of 20 gauge steel with break resistant Lexan inserts which are UV resistant. Cabinet comes with 2 keys and 6 shelves (150 lb. capacity/shelf). 36”W x 18”D x 78”H. 20 QUS 240 and 8 QUS 250.